The Women’s Physics Network (WPN) was set up in 2014 by PhD students, undergraduate students and academic staff at Southampton. 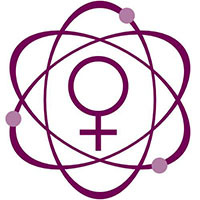 The network aims bring together female members of Physics and Astronomy, to promote the career development of women in physics and to champion gender equality and diversity within the school. Over the course of the last two years, the WPN have organised lectures by leading female researchers, educational workshops for both staff and students, and raised awareness of the importance of equality, as well as hosting a variety of social events. The WPN have also been a Vice-Chancellor's Awards winners. Speakers have included BBC Radio 4 regular and astrophysicist, Dr Caitriona Jackman, and distinguished laser scientist Professor Anne Tropper, who both shared their inspiring experiences as physicists. 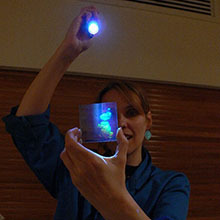 Members have also had the opportunity to learn about and make holograms with artist and public engagement leader Pearl John. 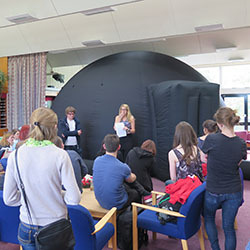 Through other events such as a “Soton Astrodome” evening hosted by Dr Sadie Jones, members of the WPN have been able to build friendships with people right across the school, from undergraduates to academic staff. This coming year, in addition to many more interesting talks and social events, the WPN hopes to set up an outreach program to engage secondary school girls with STEM subjects using physics demonstrations and the ‘People Like Me’ approach from WISE to help inspire the next generation of physicists! "In the department our staff and students are not just leading Physicists; we’re musicians, cyclists, rock-climbers, dancers and dreamers. What makes us Physicists is that we have some of the following characteristics, we are; inventive, persistent, methodical, imaginative, self-motivated, practical, conscientious, logical, honest, creative, curious, intuitive, patient, oh and outgoing, friendly and resourceful. Do come and join us!"